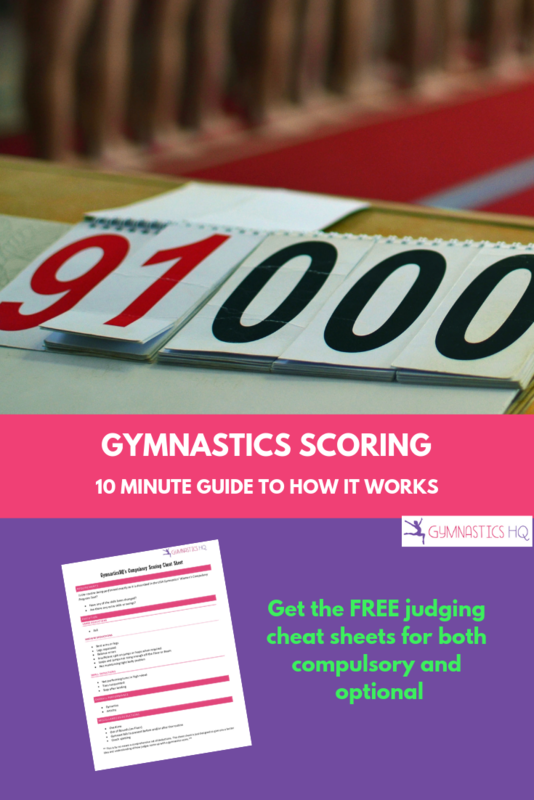 Do you want to better understand gymnastics scoring? Are you wondering how gymnastics judges decide on the score for each gymnastics routine? In this article, we’ll detail the process gymnastics judges go through when coming up with a score. In this article we’ll specifically be talking about judging USA Gymnastics’s Junior Olympic program, the gymnastics levels 1-10, along with the Xcel Program. If you’re wondering how Elite gymnastics meets and the Olympics are scored, check out Olympic Gymnastics Scoring: The Basics. Prefer to listen to this article instead of read it? Listen to the audio below. 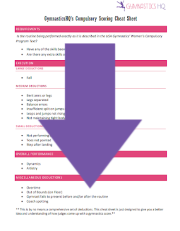 We’ve created some gymnastics scoring cheat sheets with a simplified version of the information in this article. Make sure you download them below. In order to become a judge you have to memorize the deductions and the routine requirements. At the compulsory levels you need to have memorized the compulsory routines exactly as they are explained in the USA Gymnastics Women’s Compulsory Program Text. The Optional level’s routine requirements and deductions are laid out in the USA Gymnastics Women’s Junior Olympic Code of Points Text. You also need to learn gymnastics judges’ shorthand, which is a bunch of symbols used to record a gymnast’s routine. Judges write down the symbols that correspond to the skills that the gymnast performed, along with notations for what deductions they are going to take. After a gymnast’s routine is complete, the judge goes back and evaluates the routine based on what they have recorded on their paper. Since gymnastics judging can be somewhat subjective, given that there are humans applying deductions, the judge’s goal every meet is for the gymnasts to be fairly ranked. There are several things a gymnastics judge looks at when evaluating a gymnastics routine. Requirements: Does the gymnast have all the requirements? the routine requirements. This will determine a gymnast’s start value. You can check out the level requirements here, or for compulsory levels they are the skills highlighted on the progression checklist. In addition to the special requirements and value part requirements, Levels 9 and 10 need Bonus connections in order to start from a 10. 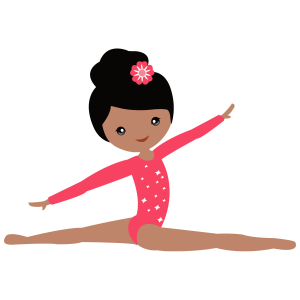 One other thing judges review their shorthand for that will affect the gymnast’s start value is whether the gymnast performed a skill that is not allowed at that level. For example, Xcel Gold gymnasts are not allowed to perform “B” valued saltos or any “C” or higher level skill on Floor. If a gymnast performs a skill that is not allowed at their level, a deduction is taken from the start value. In some cases, performing a skill that is not allowed can void the routine. For example, performing a vault that is not allowed at the level will void the vault — basically meaning the gymnast receives a score of 0. Execution: How Well Did the Gymnast Perform the Skills? The second thing gymnastics judges look at is the execution. While they watched the routine, with their shorthand they write down the execution deductions for each skill. As you can see from this small sample of execution deductions, a gymnastics judge uses their discretion to decide how much to take. You might be thinking to yourself, How does a judge know how much to take? Or Doesn’t this makes a score highly subjective? Keep in mind that a gymnastics judge has seen thousands and thousands of routines, and after seeing that many routines you know every time you see a bent leg whether that is a .1 deduction bent leg, or a .3 deduction bent leg. Judges’ scores are required to be very close to each other (when there are multiple judges on a panel) or there is a discussion. This helps to keep the scores consistent. Is this skill being executed perfectly according to the JO Code of Points? And if not, what execution deductions apply? As you can see from that tiny sample of execution deductions, they cover every aspect of a gymnastics skill. You can see small errors, such as not pointing your toes, can add up throughout the routine. Overall Performance: Did this Gymnast’s Routine “Wow”? After a gymnastics judge has determined a routine’s start value based on the requirements, and then taken deductions for execution, the judge looks at the overall routine and determines any other general deductions. A judge is keeping in mind the ranking of the gymnasts at the meet, and is also comparing the overall routine to other routines from the same level that the judge has seen. There are artistry and dynamics deductions that can be taken based on how the overall routine is performed. 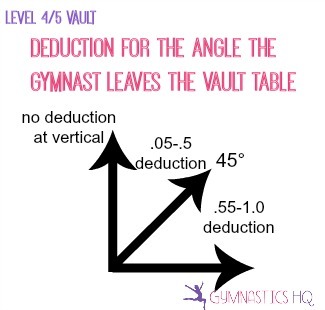 These are deductions that can be used to help better rank the gymnasts. Starting at Level 8, routines have additional deductions that can be taken based on how the routine was composed. As an example, are all the hard skills at the beginning of the routine? As opposed to spread out throughout the routine? One last thing a judge must consider before deciding the gymnast’s score is if there are any miscellaneous deductions that need to be taken. There are flat deductions for things like stepping out of bounds, being spotted during the routine, going overtime, not presenting to the judge, etc. Once these four aspects are evaluated: requirements, execution, overall performance and miscellaneous deductions, a score is computed. This is an overall look at scoring, but how does this apply to each event? Each event follows the same structure with its own set of unique considerations. The first thing you need to know about scoring gymnastics vaults is that there are three phases to a vault, and deductions are applied at each phase. The three phases are the first flight phase (when the gymnast is in between the springboard and the vault table), the support and repulsion phase (when the gymnast is on the vault table) and the second flight phase. So if a gymnast has bent legs throughout the vault, the deduction is taken three times. One of the most important things when evaluating a gymnast’s vault are the angles. A judge watches closely to see what angle she came on to the vault table, and what angle she exited. For example, when performing the compulsory Level 4/5 Handspring Vault, the gymnast must push off the vault table by the time she hits vertical or a deduction of up to 1 full point can be taken depending on the degree past vertical the gymnast leaves the table. Dynamics is a bigger deduction on vault than on the other events. Vaults should be powerful, with good height. Like on vault, one of the most important aspects of scoring bars is the angles of each of the skills. Every level has different requirements for the angle of the casts. The angle that handstands achieve and the angle out of circling elements is important at higher levels. For example, in Level 7 on Bars one of the requirements is that the gymnast performs a cast a minimum of 45 degrees from vertical. So the judge is watching the angle of each of the casts the gymnast performs. In order to fulfill the requirements, the gymnast must do a cast to a minimum of 45 degrees from vertical on one of her first two casts. After the first two times a gymnast performs a skill it can’t be used to satisfy the requirement, but additional low casts will still incur deductions. The rhythm of a bar routine is important. The skills should be performed in a row without extra casts, swings or stops. As you can imagine, one of the most important factors when evaluating a gymnast’s beam routine is her balance. Every balance error is a deduction. A balance error can be small (a tiny wobble) or large (making lots of big movements). Every jump and leap performed is evaluated for height off the beam. Split jumps and leaps are evaluated for what angle was achieved. One of the most often asked questions by parents about beam scores is why did one gymnast get a better score than the other gymnast even though the gymnast with the better score fell off the beam and the other gymnast didn’t? As you can see, there are so many factors that go into scoring a beam routine, and a fall is just one deduction that can be taken. Just like on beam, the height of jumps and leaps are evaluated. Split jumps and leaps are assessed for what angle was achieved. If a jump or leap turns, the feet are watched closely for the degree of the turn. Tumbling passes are evaluated on a number of factors, some of which are the body position during the skills, the height of saltos and the landings. As you can see, while the overall framework of coming up with a score is the same across gymnastic events, there are different points of emphasis. Obviously, we can’t explain every deduction, or every factor that goes into determining a gymnastics score (the books that do explain are several hundred pages). 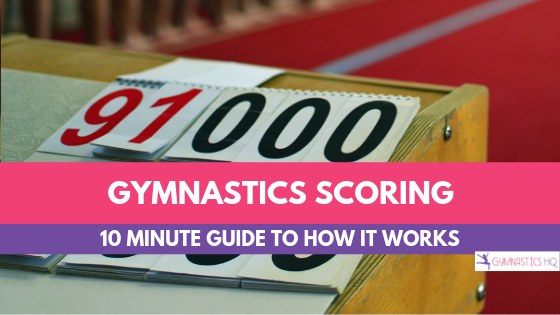 But, we hope this article has helped you to understand the process of gymnastics scoring. Now test your knowledge here — Can you pass this Gymnastics Scoring Quiz? I was just wondering, if you were in level eight gymnastics on floor, can the judges take points off if you don’t do any back skills? Even though you have all the requirements. Yes, there is a deduction for lack of variety in saltos–you need to have saltos in 2 different directions–forward, backward, sidewards. So if you only have forward skills you should learn a sidewards one also. Okay thanks! Is a front half considered a side skill? How much of a deduction is it in level 7 if your hand touches the beam during a wolf turn to avoid falling off? I have read the code of points, etc. for Xcel Platinum over and over. Our Coach is new to gymnastics. Our daughter completed all season with missing skills and without skills that would get her a 10.00 start value on B, B and F. Can you tell me what she can do to score higher this year? Thanks. My daughter is an Excel Gold gymnast. This past weekend she competed at the States Meet, during the awards ceremony her name was not called even though we knew she had placed higher than some girls that went up to the podium, when I approached her coach I was told that my daughter was put into the wrong session that she should of competed the previous day. So my daughter was not acknowledged at all for her achievements at states, we don’t even know where she placed or if she even placed at all. My question is because she competed on a different day, with different judges how true will her score or placement be once it is put against the girls her age group that competed the day before? If you are Second year gold do the judge take away pots if you don’t do a back walk over on beam? Nope no deductions. As long as the skills fit the requiremnets its fine. i was wondering how bonus is used in optional routines… what combinations make how much bonus? 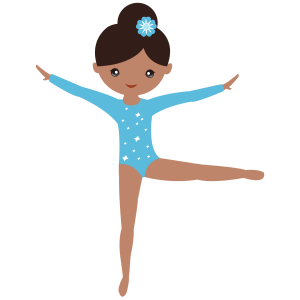 How can i help my gymnast keep her feet pointed? My daughter is left handed. How do we know where she is loosing points due to reversing the skills? Is this listed somewhere? It can be greater than your stock texting app. I love gymnastics and I love what you are doing with this website. Very nice. Do you know someone that sells used gymnastics equipment? It’s accessible on iOS and Android platforms. I have been in contact with you before about HS gymnastics and judging. I live in Huntington Station and direct Gold Medal Club Teams at our 6 locations. Need your advice for designing judging sheets for our in house judges….hope you can help. This website is truly amazing. I used SO many of your links for a school project, and it was my main source! The accuracy is incredible and I really want to become a judge at 16 as well, so this was REALLY help in addition to USAG’s website. Thank you for all the work you’ve put into this, it truly is making such a BIG impact! Thanks so much! Glad you’ve found our website helpful!